South Street is an eclectic area of Philadelphia that transforms itself with the times. Post WWII it was Philadelphia's Fabric District where my Grandmother shopped for cloth. In the 1990s and early 2000s the street had a gritty (I'm being polite with that term) vibe. As of 2016 many of the early 2000s stores have turned over except for the major stalwarts: Jim's Steaks, Lorenzo's Pizza, and Jon's. The Theatre of Living Arts is still a great place to catch a new band on the rise. There's a Whole Foods now and several upscale restaurants that I would not have imagined occupy space in this corridor several years ago. 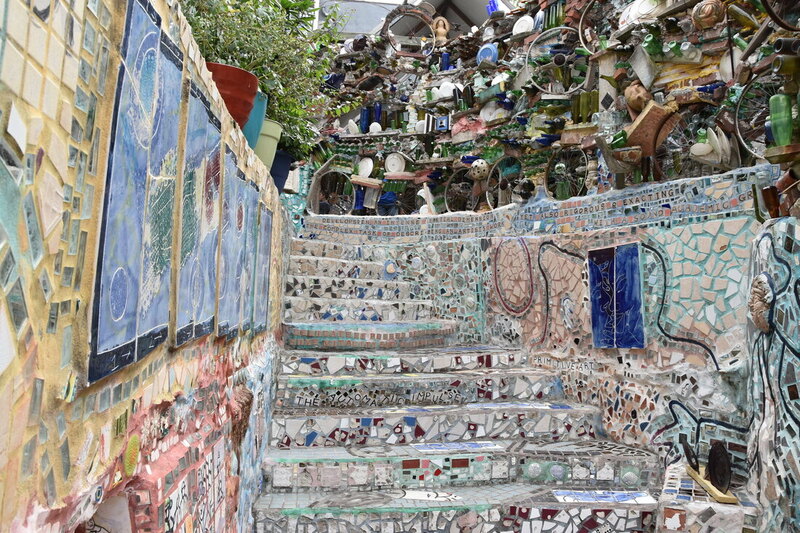 I previously lived down the street from Philadelphia Magic Gardens and whenever I passed the site on the way to the subway I'd think about going in but then take a pass. 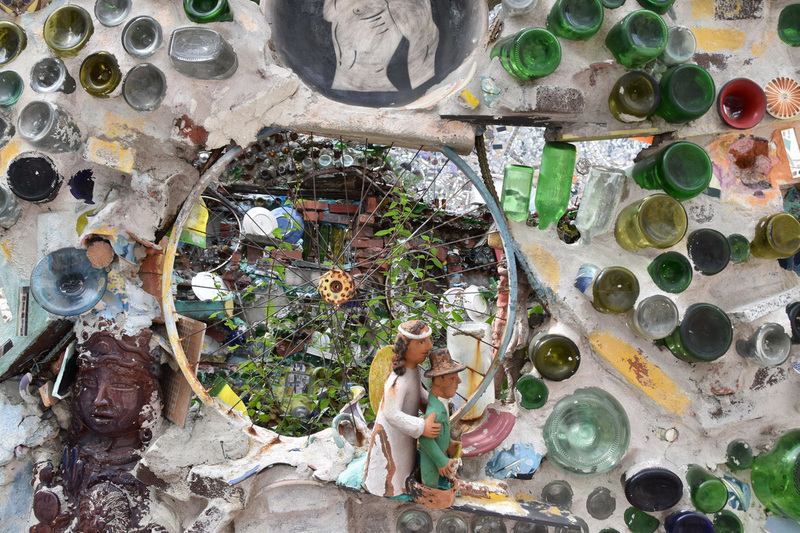 From the outside and surrounding walls it's clear what Philadelphia Magic Gardens is...it's trash repurposed as art. Broken mirror glass is the most defining feature, bottles, wheels, tiles, and other discarded knick knacks combine for a distinct visual presentation. After visiting Philadelphia Magic Gardens in September 2016 my assessment is...it's trash. I'm in the minority with that assessment. There were a lot of college-aged visitors who were enthralled with the site. 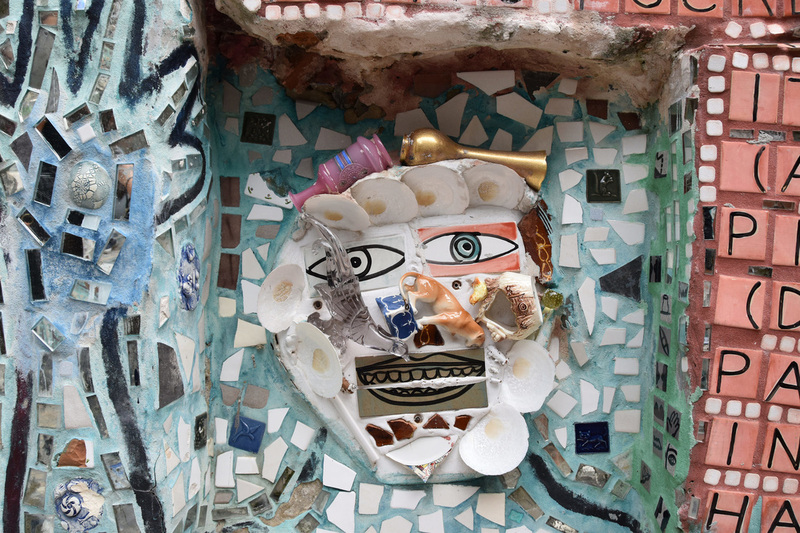 From the brochure: PMG is an art environment and community arts center in Isaiah Zagar's largest public artwork. 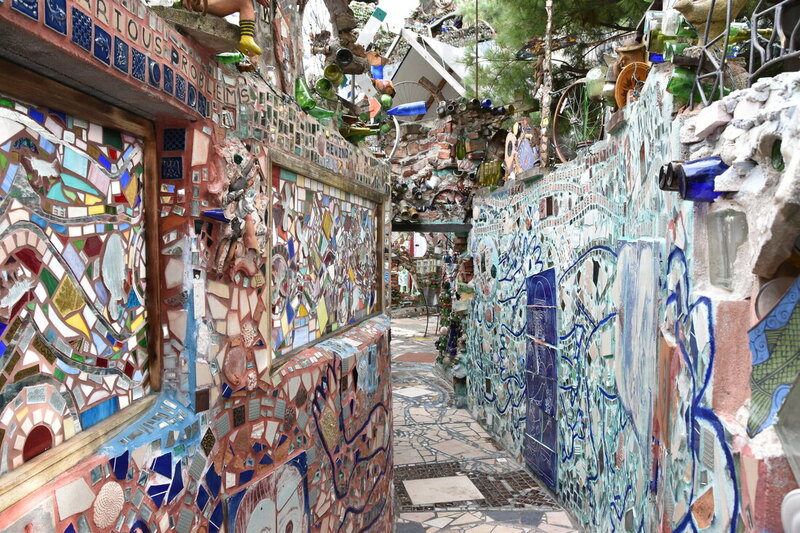 Zagar created the space using nontraditional materials such as folk art statues, found objects, bicycle wheels, colorful glass bottles, hand-made tiles, and thousands of glittering mirrors. Zagar is an award winning mural artist whose work can be found on more than 200 public walls throughout the city of Philadelphia and around world. He started working at the South Street location in 1994 and after a legal battle on the future of the lot the site became the non-profit art center it is today. Tickets are $10 and depending upon the time of the year should be purchased in advance at the PMG Website.